The modern and unique protein product consisting of hydrolyzed whey protein isolate (Optipep ™) and innovative hydrolyzed casein (PeptoPro®). Speed up your gains! 220 loyalty points Your cart will total 220 points that can be converted into a voucher of 8,80 PLN. FA Nutrition Protein HP is a powerful dose of protein in each serving obtained from a special combination of hydrolyzed whey protein isolate and hydrolyzed casein to release a special scheme. Completely innovative high-protein formula of the highest quality and bioavailability. Highly technologically advanced protein formula composed of hydrolyzed whey protein isolate (Optipep®), enriched with unique hydrolysed casein or PeptoPro®. 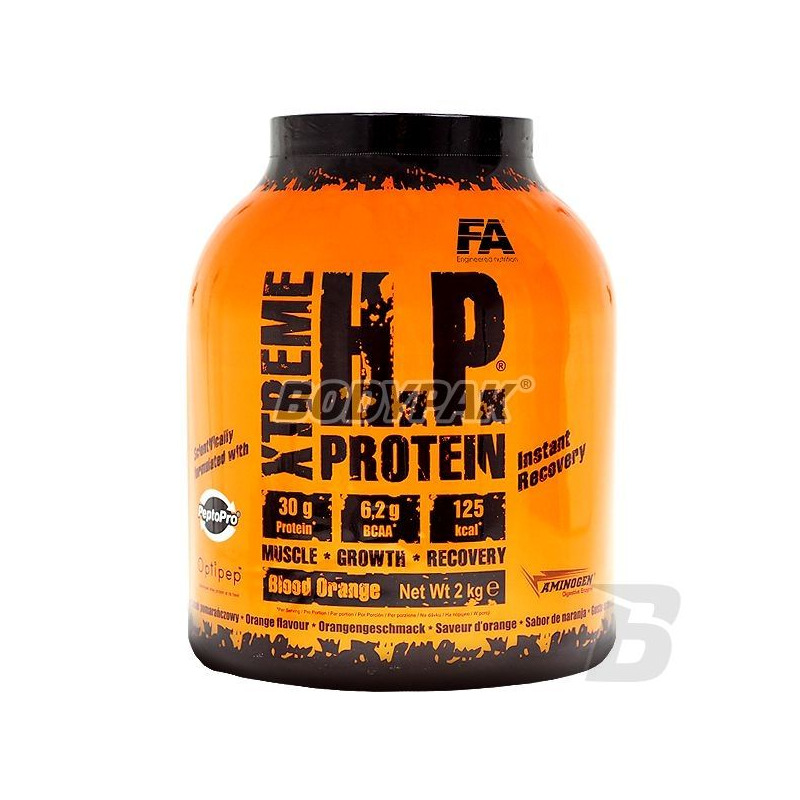 Xtreme H.P.® Protein is the highest quality protein available on the market with the highest biological value with a very low content of sugar and fat. The highest quality is performed by the addition of PeptoPro®, hydrolysed casein derived from milk for a long time to deliver the protein to the body. Xtreme Protein H.P.® secret lies in the patented enzymes that provide the body with protein hydrolyzing the peptides very accessible to absorb and build muscle at the same time reduce the typical bitter taste of hydrolysates. 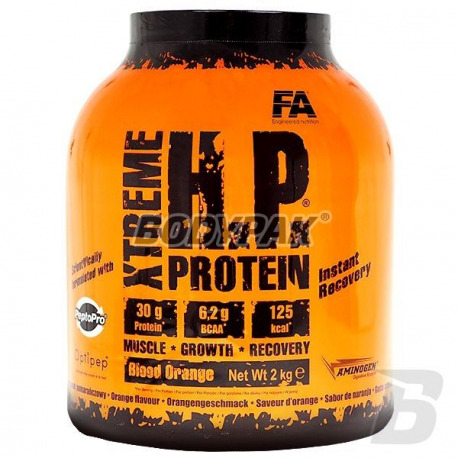 Xtreme H.P.® supplied by Protein easily absorbed di tripeptides and other amino acids will provide a positive nitrogen balance for several hours after ingestion, and providing the body with increased protein synthesis, decreased catabolism, and muscle. Xtreme H.P.® Protein consumed immediately after exercise strengthens the body's immunity and allows effectively regenerate muscles which helps to shorten the processes and wellness. Xtreme H.P.® Protein is the best protein for professional athletes and physically active people who want to ensure the optimal functioning of muscles and fast adaptation during periods of increased body burden intense workouts. Składniki: OptipepTM [hydrolizowany izlolat białka serwatkowego (z mleka), emulgator: E322 (lecytyna sojowa)], PeptoPro® (hydrolizowana kazeina (z mleka)), aromaty, barwniki (karoteny, koszenila)4, chlorek sodu1,2,3,5, regulator kwasowości (kwas cytrynowy)2,4, chlorek sodu4, substancje słodzące (acesulfam K, sukraloza)2,3,4,5, barwniki [(karoteny, koszenila)2, (antocyjany, koszenila)5], kompleks enzymów trawiennych (Aminogen®), substancje słodzące (acesulfam K, sukraloza)1, barwniki (koszenila1, chlorofil3), regulator kwasowości (kwas cytrynowy)1,5. Dotyczy produktu o smaku: Grejpfrutowy1, Marakuja2, Kiwi3, Pomarańczowy4, Owoce leśne5.